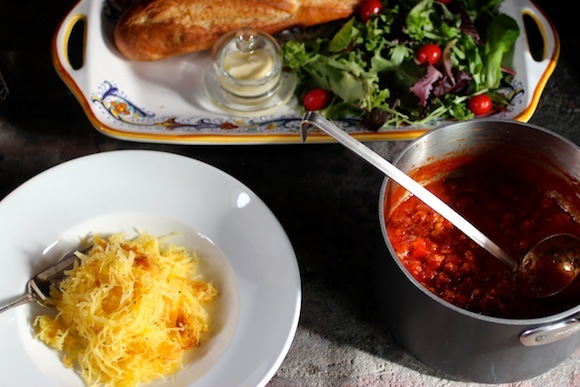 The addition of spaghetti squash is mine, but the tomato and sausage soup idea comes from one of my favorite books…and can you believe it – it’s NOT a cookbook? It is An Affair With A House by world-renowned interior designer Bunny Williams. She talks about being mortified when guests showed up at her (uber-fabulous) home at 11 AM and happened to be starving. She had planned to give a tour of the house and serve coffee since their schedule was tight, but all of a sudden, she had twelve people for lunch and was completely unprepared. 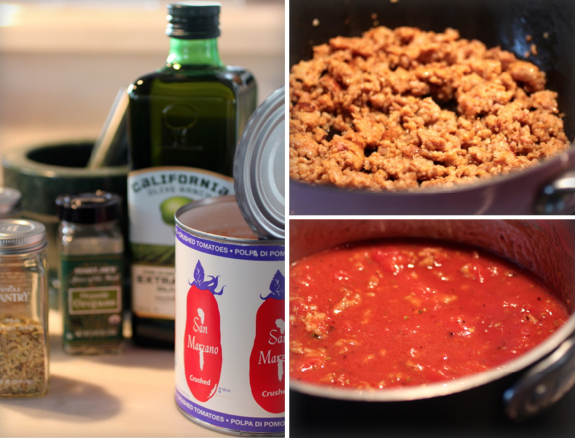 But being the ultimate hostess, she made it work, with ease I might add… Bunny advises keeping a few cans of San Marzano tomatoes in the pantry and some Italian Sausages in the freezer. Add a simple salad and a loaf of French bread and you can be a hero too. 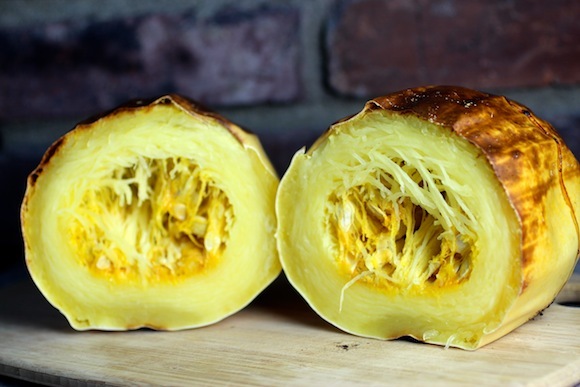 Pierce the shell in several places with a sharp knife, then roast the whole spaghetti squash in a 400° oven for about one hour. Let cool slightly. Slice the squash in half width-wise. Scoop out the seeds. Then use a large fork to scrape out and separate the strands of squash. I prefer roasting the squash whole, because the outer skin is tough and difficult to cut when raw. After cooking, the skin is soft and easy to slice. Drizzle the squash strands with a high quality olive oil, and season with salt and pepper. Brown sausage in a bit of olive oil. Drain well and set aside. Meanwhile heat 1 T. olive oil over medium heat in a heavy soup pot. Add fennel, chile flakes, and garlic – sauté for about a minute taking care not to brown the garlic. Add tomatoes and 1 1/2 c. water. Then stir in oregano, cinnamon, and sausage. Bring to a boil, then simmer for 30 minutes. Season with salt and pepper. Ladle soup into bowls. 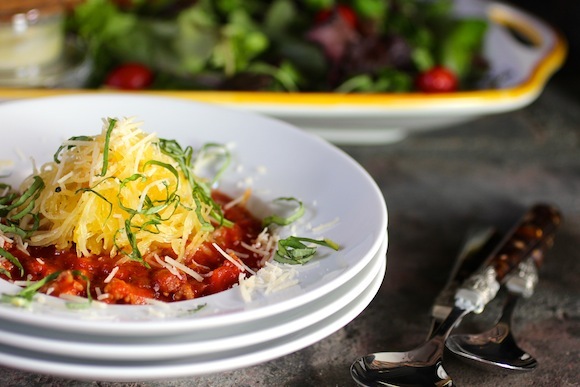 Top with a mound of warm spaghetti squash and garnish with grated Parmesan and basil ribbons. This looks so delicious! Love how you use the squash on top. This looks wonderful. I did something similar by accident. I had frozen some roasted spaghetti squash and some red tomato sauce. Well, the squash gets totally liquidy and turned it all into a soup. It was good! Oh your photos are simply so enticing. I wish I had a bowl of this right now. 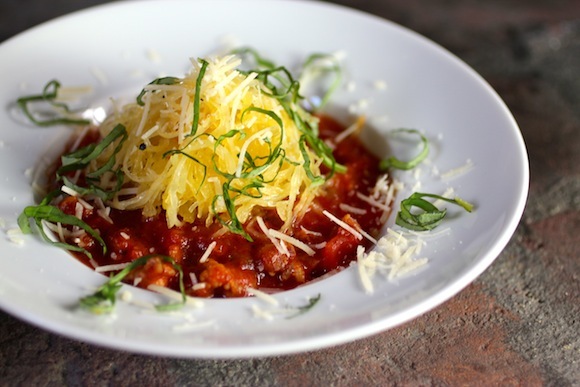 I love the addition of the spaghetti squash to tame the acidity of the tomatoes and spiciness of the sausage. brava. You really came up with a new way to use my favorite squash. It looks so so yummy. Great photos, as per usual. I love getting your posts in my email box! 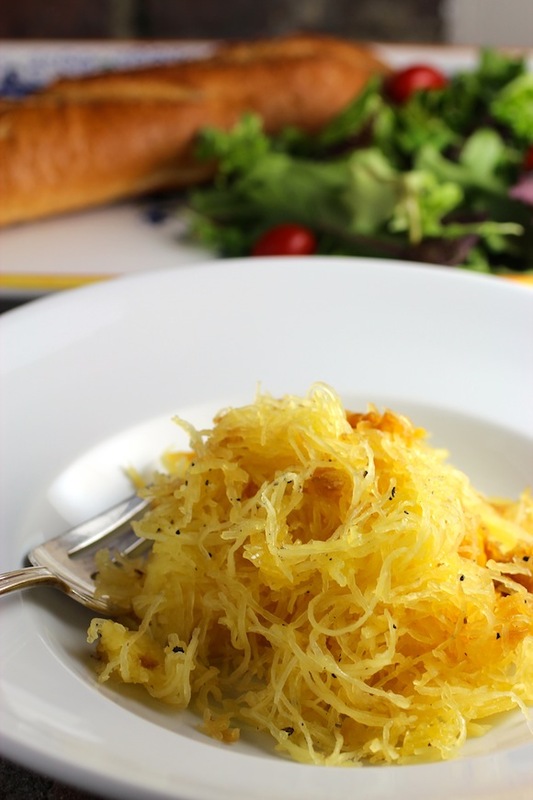 Believe it or not, I’ve never actually tried spaghetti squash. Don’t ask me why, it just never happened. I need to correct that soon, and this lovely soup sounds like the perfect way to do that. 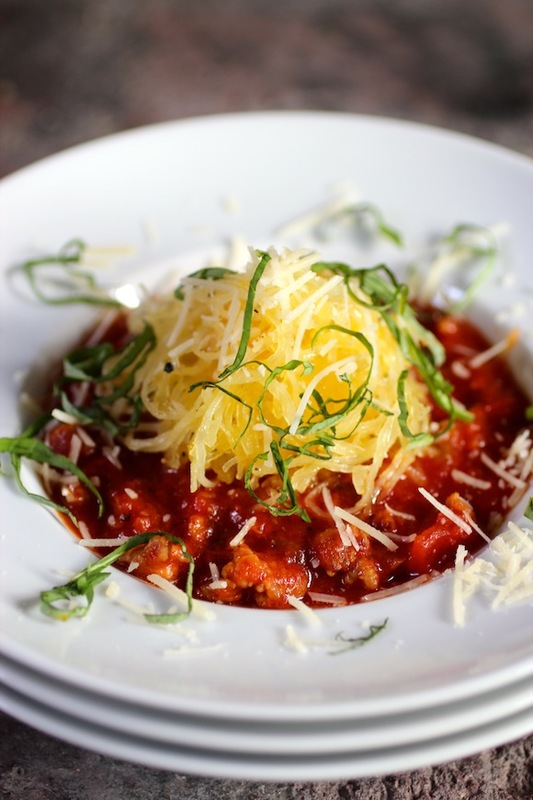 I am loving the idea of spaghetti squash in soup in place of noodles or rice Lori Lynn.My mind is twisting.